An AFP news article written more like an Arab editorial charges that a fire in an olive grove was set by Jewish "firebombers" from Gilad Farms. IDF artillery brigade soldiers at the scene Friday spotted an Arab fleeing a blazing field set afire at nearby Havat Gilad (Gilad Farms) but did not manage to catch him. The hot winds and high temperatures in the area quickly whipped the flames into a fury that leaped across the fields of clover, reaching to the trees in the Arab-owned olive groves. According to Itai Zar, head of the small community, it also threatened homes, where firefighters fought to contain the raging blaze that consumed tens of thousands of shekels' worth of agricultural products. 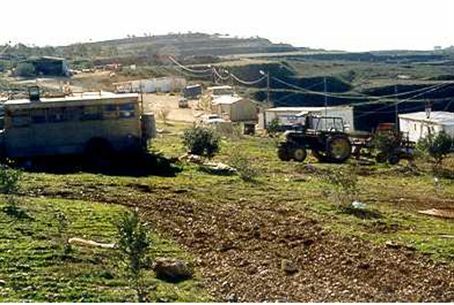 Quite the opposite –in September 2009, on the second day of the Rosh Hashanah Jewish New Year holiday, Arab arsonists torched a field on the site, which quickly spread to the small community’s infrastructure. Within minutes, two homes were burned to the ground. The main sewerage line was badly damaged, as was the community’s electrical grid, leaving more than 100 residents without electricity and sewerage systems for days. Damage was estimated at half a million shekels ($1.4 million). The oft-repeated accusation of Israelis setting fire to Arab olive groves is not new but is rarely backed up with hard evidence. Each year during the olive harvest, Arabs, protected by IDF soldiers, gather their crops while unprotected Jews, harassed by Arabs, anarchists and foreign activists, attempt to pick their own crops. The fact that the barbed wire is designed to prevent terrorist attacks from local Arabs who have repeatedly attempted to murder their Jewish neighbors escaped the writer. Agret painted a graphic epic for his reader: the poor old Arab man against the backdrop of the brutal Israeli soldiers who won’t let the fire trucks put out the flames that are destroying the olive orchards. But Agret adds a fillip of hope; perhaps the drafted youth among Israel's forced military may someday relent. Agret apparently did not question the IDF military command, to find out whether there was an investigation into the incident? Did he call any government authority at all, in fact, asking for a comment? Nor did the journalist ask the Samaria Regional Council for a statement about the blaze, to see if perhaps the leadership condemns such an act, if it proves to be arson by Jews? He also did not report if he questioned the Palestinian Authority security force to see if there was an investigation? Instead, he proceeded to further indict the Jewish residents of Gilad Farms as thieves. “Tawil says last week settlers from Havat Gilad harvested the fruit of 800 trees belonging to his family. ‘Every year they steal our olives and burn our trees,’ he says,” Agret wrote, without bothering to seek a response from those accused. Agret added with dripping contempt that the Jews who live in the community are “among the most hardline in the West Bank” and are wont to quote “one of their spiritual and ideological gurus, the late rabbi Mordechai Elyahu.” (sic). The rabbi to whom Agret referred with such cavalier indifference, Rabbi Mordechai Eliyahu, was one of the Jewish world’s most revered rabbis, a prominent Jewish legal adjudicator and spiritual leader, who recently passed away this past June. He served as the official Chief Sephardic Rabbi of the State of Israel from 1983 to 1993. Meanwhile, David Ha’ivri, director of the Shomron (Samaria) Liaison Office, charged the incident was linked to an attack at the Jewish community of Elon Moreh, in which two residents were set upon by a mob of Arabs and foreign anarchist activists, who beat them with rocks and metal bars, and a similar attack in which a field was torched at Havat Gilad. “Friday’s violent events at Havat Gilad and Elon Moreh were obviously planned and orchestrated by provocateurs posing as givers of humanitarian aid," Ha'ivri said. “Activists of the British Oxfam organization accompanied by journalists were photographed at the site (Israel news photo: Yehuda Simon) where events led up to the arson of crops belonging to residents of Havat Gilad,” he noted.